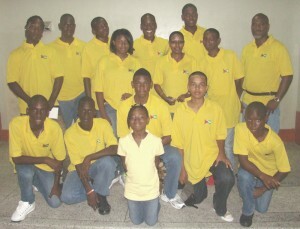 A depleted Hikers Hockey Club junior team departed on Tuesday morning for Trinidad and Tobago to compete in that country’s annual Easter Junior tournament for schools and clubs within the Caribbean region. The club will be fielding teams in the under-16 and under-21 7-a-side boys categories as well as taking part in a 11-a-Side Tri Nations tournament among Barbados, Trinidad & Tobago and Guyana. The Club was forced to reduce the size of its traveling contingent due to the excessive costs of traveling to Trinidad over the Easter weekend, with air fares now in excess of US$400 for travel during that time period. Although a squad of eleven boys and one girl, including two guest players from the Old Fort hockey club, were able to make the trip, five others had to be left home because of the excessively high air fare. In 2009 Hikers placed third in the under-16 category, with their inspirational captain Shaquelle Assanah coping the MVP prize for that category. This time around Assanah will be relying on vice captain Andrew Stewart to partner him in defence, with the skillful duo of Antonio Pemberton and Clarence Edwards running the midfield and the aggressive Aroydy Branford at centre forward. The under-21 squad will be led by the capable pair of Akeem Thompson and his deputy Anton Duke with help from outstanding defenders Rayon Branford and Travon Younge. Also in the in the line-up will be the dependable Michael Harding and debutant Kevin Melville. The team will surely miss the services of playmakers Ryan Primo and Leon Bacchus who were among the players unable to make the trip. The lone female player on the team Macaela Harding will be hoping to go one better than last year’s performance when she helped lead her adopted Club Notre Dame to the finals of the under-21 category. The squad will be coached by national player Jerazeno Bell while Michael Harding Snr. will perform the duties of manager.